Recently I posted a review of the Acavallo Arena Stirrups, my first foray into modern safety stirrups. The second brand that opted to try are the SafeStyle Stirrups. The stirrups use a simple, effective design. Even if you fall and the stirrup releases your foot, the rubber branch will be undamaged. No moving parts means nothing to malfunction! From a distance, this version of the stirrup is pretty traditional, too. The SafeStyle stirrups are manufactured in the Netherlands and are a smaller, family-owned business, quite different from a company like Acavallo. There’s a lot to like about the design of these stirrups — they are simple and elegant. There are no “moving” parts, so nothing to malfunction and nothing to break. 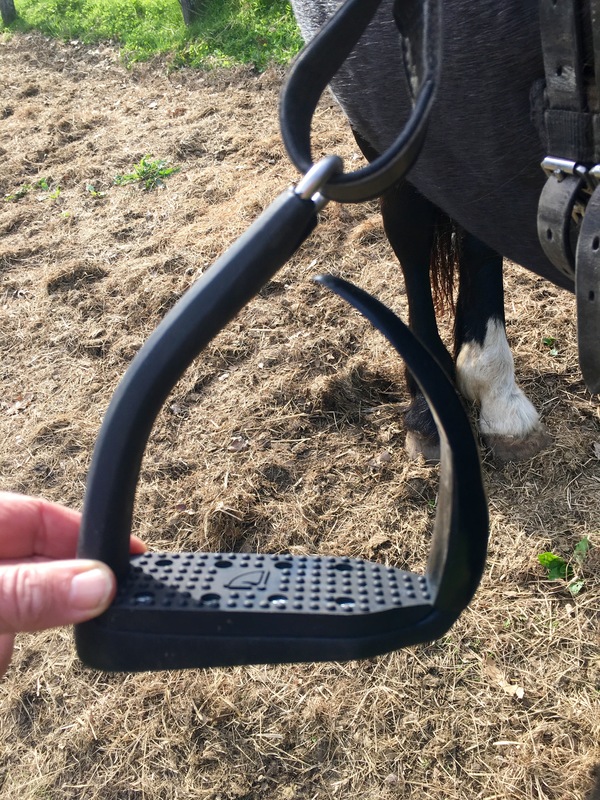 One branch of the stirrup comes up only a small way and is covered by a “sealing rubber” that bends easily out of the way if you fall and your foot needs to come out of the stirrup. They are reasonably conventional looking, especially if you choose the silver metal version. In some disciplines, that’s a real advantage. The stirrup hangs in a naturally forward position which eliminates twisted leathers. The offset eye allows the stirrup to hang straight with no twisted leathers. The footbed is wide enough to be comfortable. It is angled so that it places two/thirds of the foot to the outside of the stirrup. This is not noticeable when you ride. The metal version are a nice weight (I’m not crazy about lightweight stirrups as I find them harder to pick up when lost); the composite version is reinforced with stainless steel and is a mid-weight stirrup. I ride with these and haven’t had any problems with them. The are relatively inexpensive. The composite stirrups are $117 and the stainless steel are $105. There is no box and no protective packaging. The stirrups were shipped in a standard box in plastic bags. Packaging is minimal. I ordered two pairs, one stainless, the other composite. They came in plastic bags in a cardboard box that was pretty shot by the time it arrived in the U.S. The stainless stirrups looked nice and shiny; the composites stirrups didn’t look new. They looked like someone had used them and then they’d shipped them to me. The sizing on the website is only in centimeters. 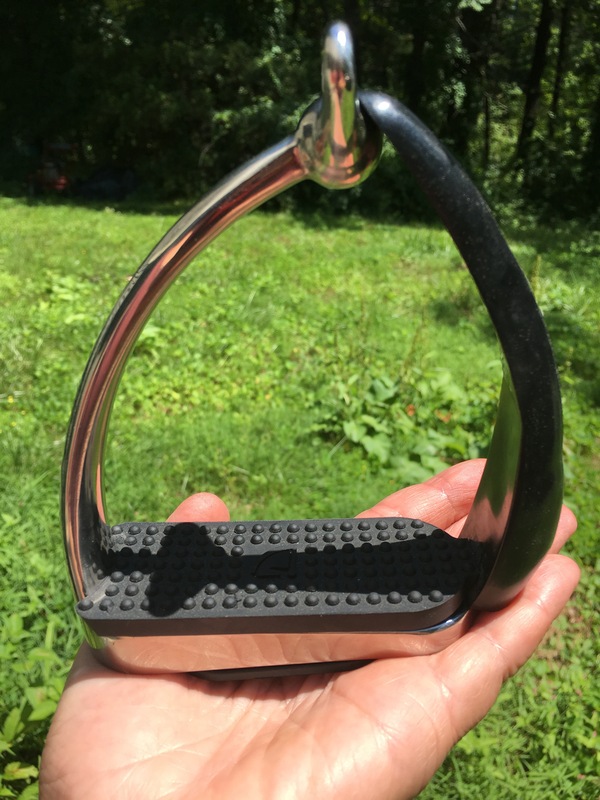 My bad, but I didn’t realize that I’d purchased the stainless stirrups in the 10 cm size, which is for children and small adults — 3.9″. I can’t fit my foot into them. There are not returns. I asked if I could exchange or return them and was told it is too expensive to ship to the U.S., so basically, I was out of luck. I will try to sell them because they are nice stirrups. I wish I’d been more careful. What’s tricky about the website is that the different sizes are listed as different products. I think I would have done the conversion if there had been a drop down menu and I’d realized how small they were. While the steel stirrups were very shiny, the composite stirrups arrived looking scuffed. Even the large size is not that big. 12 cm is 4.7″. My feet fit in the stirrups just fine, but if you have large or wide feet, these wouldn’t work for you at all. There is no distributor in the US. You must buy them directly from the company. I like these stirrups a lot. I was very disappointed that I couldn’t return or exchange the size that didn’t fit but they were resolute about not accepting returns. I think that if they want to sell to US customers, they need to be clear both on sizing (having inch equivalents would help a lot) and that there are no returns. US shoppers are pretty used to having the flexibility of returning or exchanging products. This might change if they start selling here. Compared the the Acavallo? They are both pretty nice. I find the Acavallo stirrups a tad bulky, but don’t notice it when I’m riding. It’s harder with the Acavallos to make sure that the release branch is situated correctly, something that doesn’t happen with the SafeStyle. 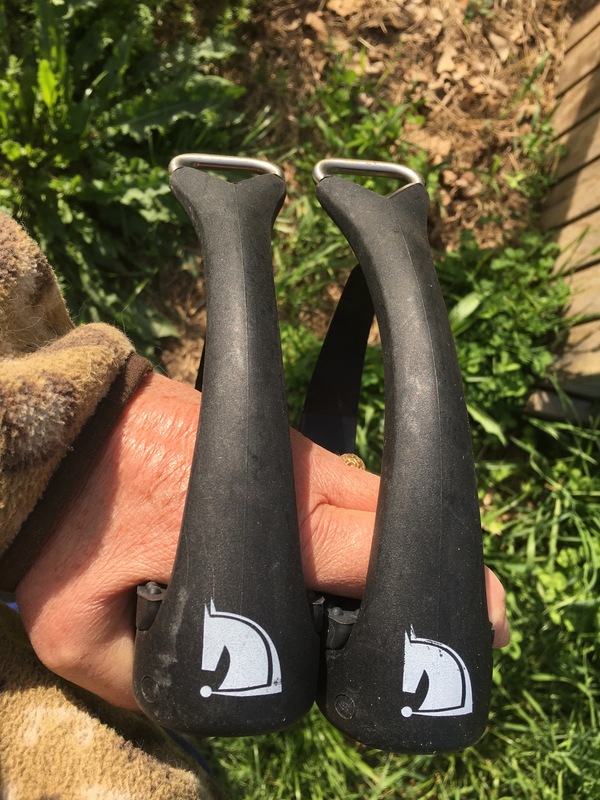 If you don’t mind the lack of packaging and don’t care if the product doesn’t look pristine when you take it out of the shipping box, the SafeStyle stirrups offer an elegant solution at one of the best prices for a modern safety stirrup. Those stirrups look really nice, but their customer service (or non-service) is really lacking. I’m not sure I would order from them, based on your experience. Did you raise the issue of the scuffed stirrups and if so, how did they respond? I did not raise the issue of the scuffed finish because the company was so resistant to the idea of returning the ones that were the wrong size. I even explained to their PR/marketing person that I intended to write a review of their product and that it would definitely impact my overall satisfaction with their product, but that didn’t make a difference. I think the SafeStyle stirrups fill an important niche — they are almost half the price of the Acavallo Arena stirrups, and some of the Freestyle stirrups are $350 or more. The trade off is the product isn’t always going to look shiny and new and their customer service is lacking. The company has been around for awhile — I’ve seen reviews of these stirrups from back in 2012 and it looks to me like they might have, at one time, sold through VTO here in the US. Many family owned companies aren’t willing to give up enough margin to make it profitable for distributors. That may be the case here. BTW, my husband thought the design was excellent and he’s an engineer. I have not tried those, but honestly, after my bit + stirrup accident a year ago, they look to me like an accident waiting to happen. I can easily see how another strap, bit, body part could get caught up in the section that is separated from the main part of the iron. I have had this thought when I’ve seen other similar irons too over the last 6 months or so. Yikes! I thought about you and your accident when I looked at these. I guess it could happen, but the rubber side keeps errant straps away and there is only a nub at the bottom of the open side of the stirrup. The rubber would bend completely and then come off if it got caught on anything. I can see why you would be super cautious, though. Have you changed the stirrups you use since that happened? Hmmm. . . okay, I think I understand it a little better now, but I’d have to touch/feel them in person to figure it out. I did not change my stirrups. I don’t think it was the stirrup’s fault. I am now vigilant about never letting Knight (or any horse) turn its head to the side, nor put the head down to rub. A good friend told me her friend’s horse leaned down and something got caught on his front boot and he flipped and died. Another blogger told me she saw that same boot rub accident with the horse flipping over on the rider at a show. I went to the million dollar Grand Prix out at Thermal this spring. I was mortified when I saw a big name rider leave the arena and lean down and forward to give his horse a treat while mounted. The horse curled its head and neck right around to grab it. And today on Instagram some young rider posted a very pretty photo and he was doing the same darn thing! So I left a long comment. I’m turning in to “that lady.” But if it helps avoid another accident it will have been worth it. I was really gratified the day last year I watched a friend in AZ take a jumping lesson. Her trainer was very old school and after the lesson was over, my friend’s mount turned it’s head and the trainer scolded her and said, “Don’t EVER let a horse do that! I have a friend in a wheelchair for life.” Sure enough, the friend mentioned had a similar accident to mine but with much more dire consequences. It is crazy easy for horses to catch their bit on something. Zelda rubbed against a post and caught the ring of her bit on a hook, which she promptly pulled out of the wall. It made me far more conscious of the potential issue. Luckily there was no long term consequences. Like you calling awareness to that problem, I feel a bit like that about stirrups. I’m not certain that getting caught up in my stirrup caused my knee fracture, but I think there’s an excellent chance that it did. From that moment on I decided safety stirrups only. Why take the chance of getting caught up in one and maybe getting hurt even worse. I wish the people who make stirrups would understand that people are bigger these days. Not in weight, although that is true, but in overall body size. I bet my lunch that most stirrups are created using measurements from a 150 years..or more, ago, and people, back then, were smaller. I say this because my feet are BIG. Doesn’t matter what footwear I’m wearing, even a 5″ (12.5 cm) stirrups, the largest I have ever found, still doesn’t fit my feet. 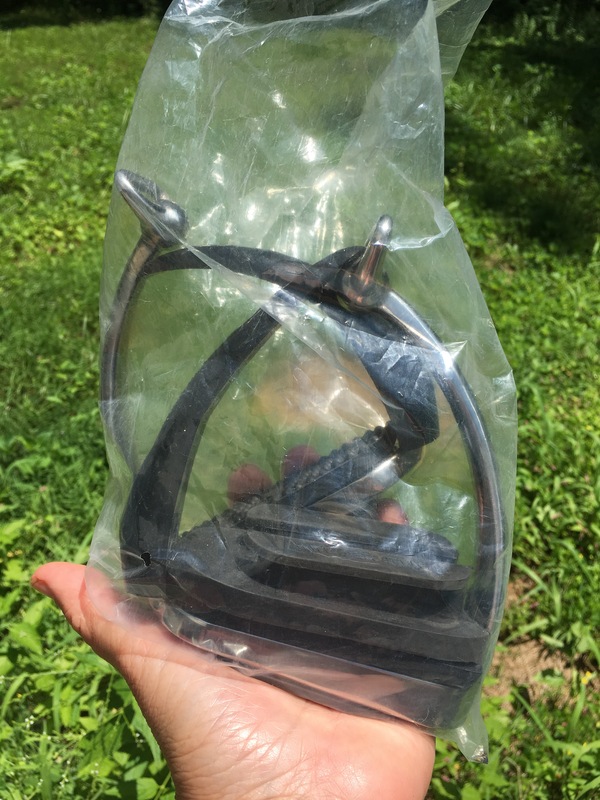 Currently I’m using a ‘safety stirrup”…one with a rubber band on one side, and my foot fits in that..but it looks dorky and I bet isn’t allowed in a dressage test. Oh for a 6″ (15 cm) iron!! Yup. Very true. I wear a size 11 shoe (43 European) and the larger size of the Safestyle works for me, but there’s not a lot of wiggle room. The Arena Acavallo stirrups and Freejump stirrups also come in only one size. Guess there is room in the market for a larger stirrup bed! Ahhh, so I’m NOT alone in the BigFoot world!! Thank you! I thought it was just me alone in the big wide world. I’ve never worn a dressy shoe in my life. They don’t come in big sizes. But…that’s okay, I’m a tomboy who never gave a rip about fashion, dresses, or anything else like that. Men’s boots fit. Ive used them for years with training young horses. I find them great and feel very secure. No twist of leather is also very nice. They are indeed very elegant and i always got lots of reactions what a stunning stirrups I have. Im going to order the black ones now, they look great as well. What is strange to me, i got mine in a beautiful secure box, not in a bag. I’ve thought of ordering a second pair because I like how they are forward facing (as you say, no twist of leather). I also find them very comfortable.